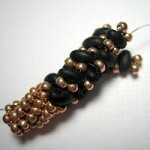 Not a fan of the newest two hole bead, the Twin Bead, I haven’t seen many patterns using it that have wow’d me. This one for using twin beads in a twisted herringbone. I have been quite suspicious of any bead with two holes, it just doesn’t seem NATURAL. One of my favorite herringbone patterns is Virginia Jensen’s Spinner Rims from the October 2009 issue of Bead and Button. Herringbone and I had a more platonic relationship, until I began experimenting with different sized beads and realized how versatile and surprising this stitch can be. In this Beadaholique video, Andrea shows us How to Do Herringbone Stitch. To bead or not to bead.